First week home so there won't be much excitement in this week's post as we get back to normal. No pretty sunsets or exotic food or colourful buildings! First day home. We didn't do much. Any groceries we needed I picked up from the store in the building. I met a friend and picked up our mail. What do I miss from Mexico? Sunshine, warm temperatures and friendly people. Twice weekly maid cleaning. Grocery prices! Tuna, shrimp, ceviche! What is it nice to have back home? Cold water from the tap, my kitchen and our own bed and pillows!! Having my own kitchen and pantry I made clam chowder for dinner with focaccia. WOW we slept in and the clocks sprung ahead so it made for a short day. As it was a gloomy one it didn't really matter. We went out for groceries and had sticker shock at the prices for fruit and vegetables and other items. I spent some time with a friend in the building, catching up. I had a beef heart in the freezer so cut it up and put it in the slow cooker along with beef stock, onions, potatoes, carrots, celery, white turnip and spices. Another lazy day getting back to reality. John did a Costco run. Still getting caught up on laundry and stuff. John's getting all his favourites this week oven fried chicken with broccoli. Other than going out to get some ingredients so John could make his salsa for lunch tomorrow we didn't do much. Slow cooker ribs with coleslaw. Well, the best-laid plans etc etc. John's birthday is the end of the month and this year his health card, driver's license and license plate stickers are up for renewal. We head out together for College Park. It dawned on me on the subway that we could have made an appointment! Service Ontario is more packed than I've ever seen. One guy was calling out the numbers for service, seems they had a system glitch so the monitors weren't working along with anything else. The clerk said it would be a 1.5 hours wait. John adamantly refused to wait that long. Home (after a Starbucks flat white) and I logged on to make an appointment. Turns out can only make an appointment for health card, ENHANCED driver license (so you don't need a passport to cross into the US) and photo card. Oh wait, you can renew health card online, NOPE, only works if your driver's license doesn't expire for a year, which is not the case for John. Can you guess I was once a business requirements analyst at one point? I did my first baking this year, cranberry lemon loaf. We had gotten our espresso machine just before we left for Mexico so John tried it out and made cappuccinos to have with our loaf. A much more normal Toronto day for us. 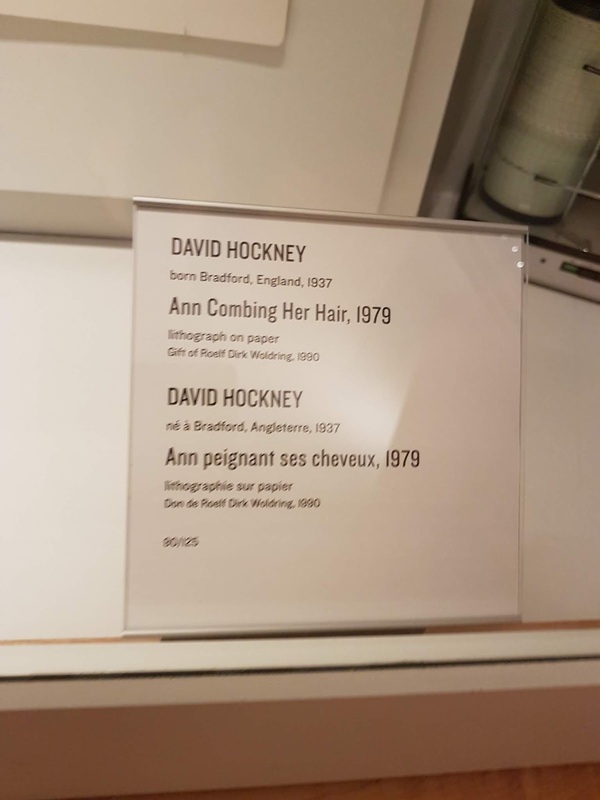 We had tickets for an exhibit at the AGO, Art Gallery of Ontario. It is spring break here in Toronto (note to self check before getting tickets that week) so there were many kid friendly activities taking place. We had lunch in the Members' Gallery, both dining on spinach quiche, reminding us that we love quiche and should make some soon. 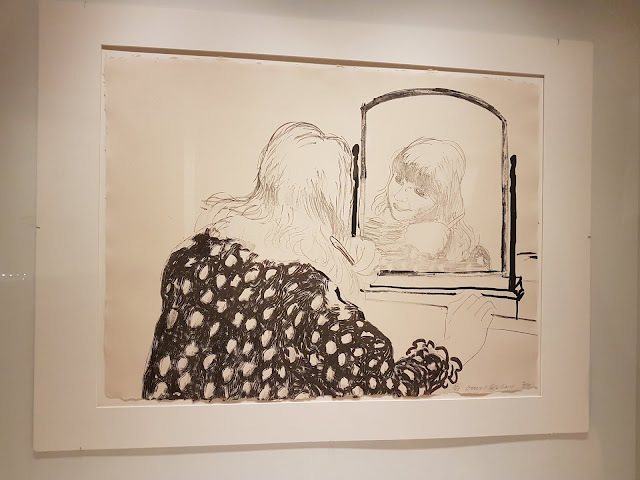 We looked at a few new pieces before we went to the main exhibit. 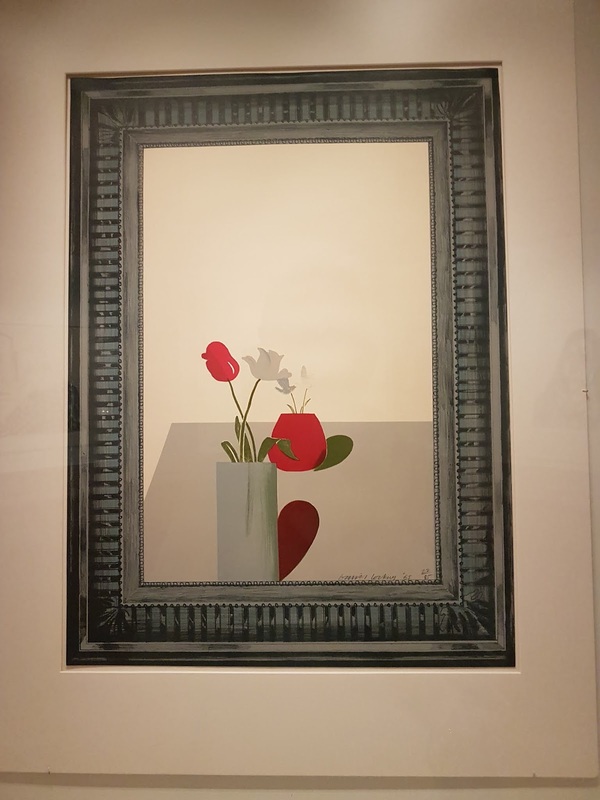 This David Hockney piece really caught my eye. 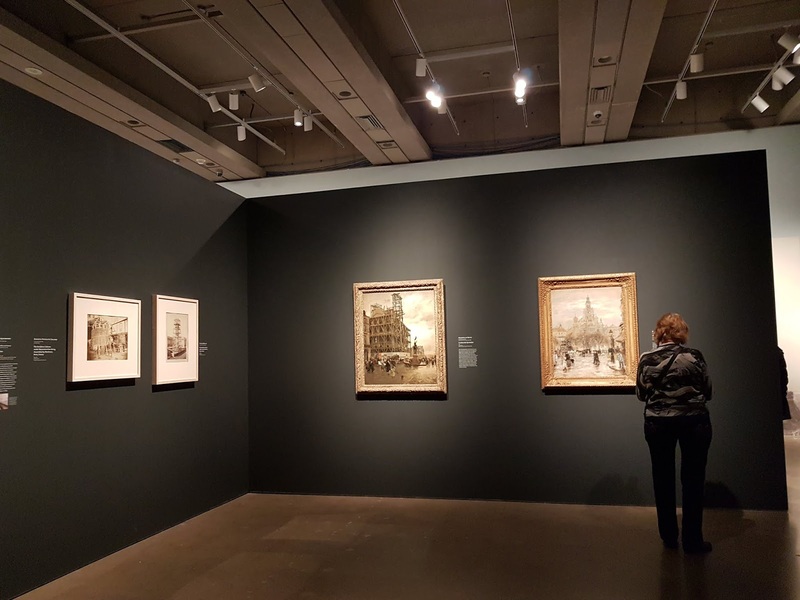 “Impressionism in the Age of Industry,” is a collection of work that draws connections between a city in great flux, when Paris moved quickly from a medieval place to one in the throes of the Industrial Revolution. 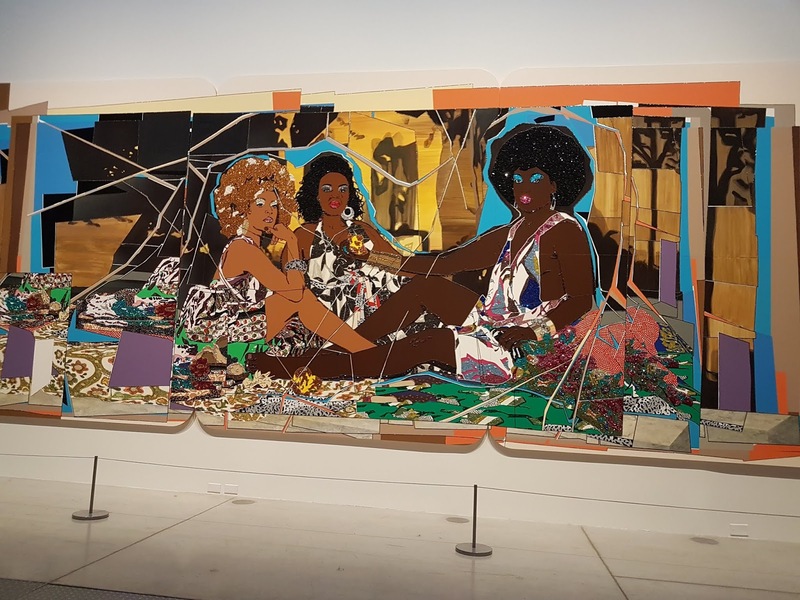 When I received the AGO magazine announcing a new exhibit called Femmes Noires by Mickalene Thomas, I knew I had seen her work before. It was in Boca Raton last November. 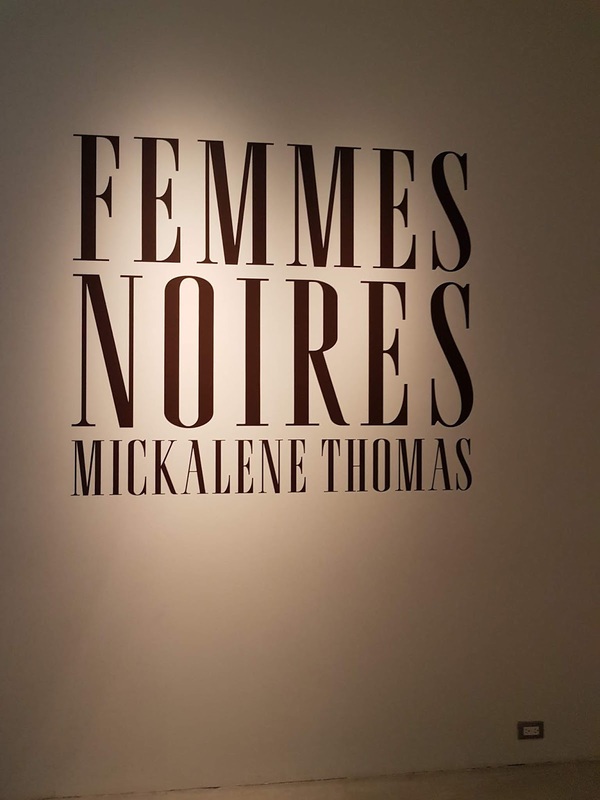 The Brooklyn-based artist has created an ode to Black womanhood for her first large-scale solo show in Canada (after exhibiting on billboards across the country as part of the 2016 Contact Photography Festival). 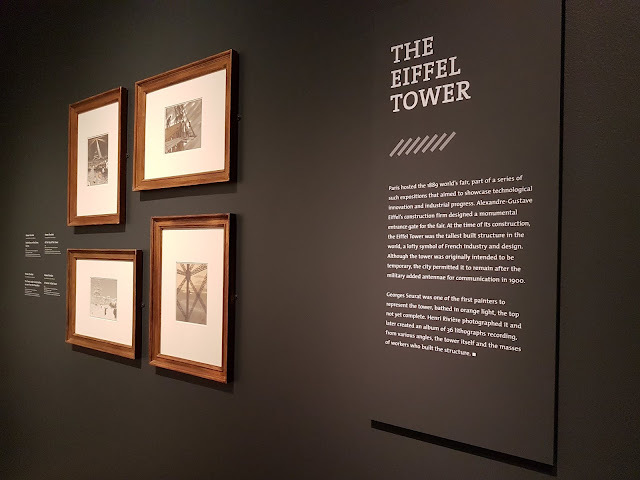 Her love of the French Impressionists also informs much of her work – she is devoted to reimagining the traditional in her own image. 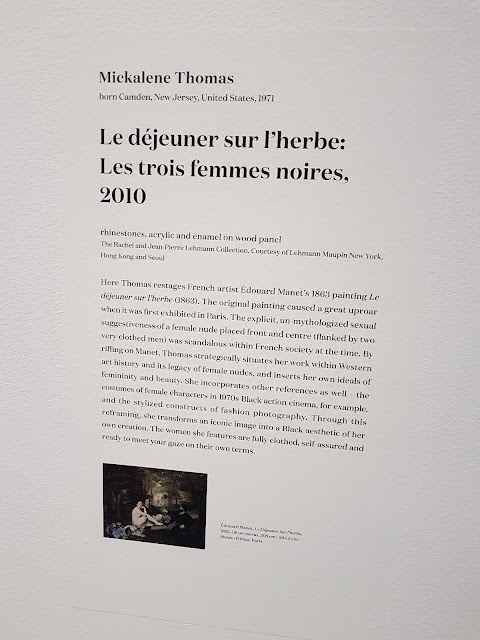 Le déjeuner sur l’herbe: Les trois femmes noires, is a reinvention of Édouard Manet’s 1863 painting and the centrepiece of the AGO show. The 10-by-24-foot work replaces the white men and women having lunch with three Black women adorned in luxurious dresses, full Afros and rhinestones that mimic pointillism. John made chicken wings and fries for dinner. He timed this perfectly and it was absolutely delicious. This being St. Patrick's this weekend I thought I'd post a photo of a famous Irishman. Funny enough, I didn't get a lot of reading done other than Her Name was Rose and let's just say "be careful what you wish for". It was a good gripping read. You must have been so happy to be out of the snow for awhile. These are dazzling. Especially the Eiffel Tower set. Oh, for those warm Mexican temps! Love the idea of a bowl of clam chowder. ANy soup works right now but that clam chowder sounds good. Love the artwork. Sorry to hear about the fiasco with renewing everything. We do thave renewable health cards here. It's been years since I've been to the AGO. I went to a museum earlier this week- also at March break. 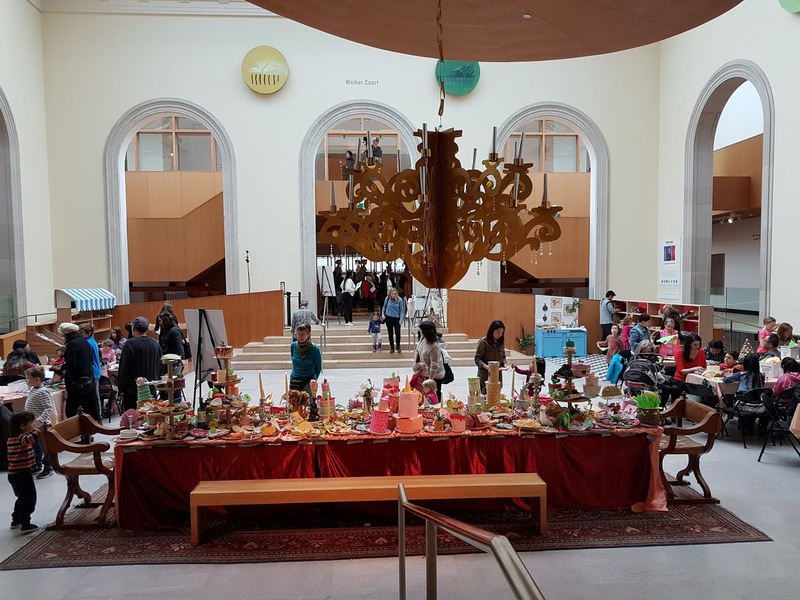 It was busy with kids. Always interesting going to a gallery. You could save me some quiche for when I get back, Jackie. :) :) Thanks a lot! Am glad you found a few good things to come back to in Toronto! Like David Hockney's piece you chose for your thumbnail pic -there's a subtle awkwardness that draws one in. 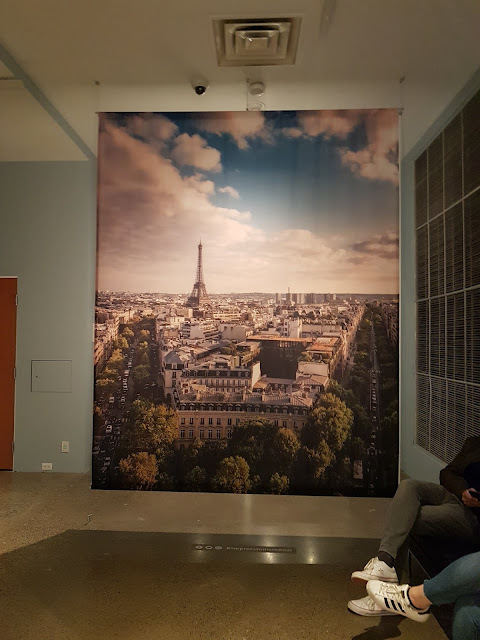 Also, I like how in the Eiffeltower piece,it has lost its hugeness, and has become part of the city! Have to admit I don't like the approach of les trois femmes noires. it has totally lost the mystery of the original. 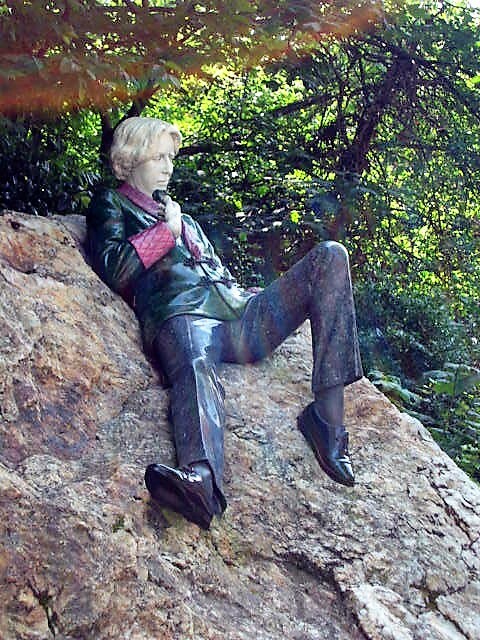 But I do like Oscar Wilde's sculpture - more true to life! Thank you for your comment on "Spiky" - I needed "something else" than nature, but after no.15 I'm running out of steam, lol! 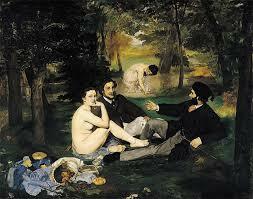 Many thanks for linking to All Seasons with serious art!! That adjustment to the North may happen quickly! Yes, Jesh, I was really drawn to the Hockney pieces. Must go back to see more. Oh well, it all worked out in the end. I didn't see that statue of Oscar Wilde though I have seen the one in Dublin. 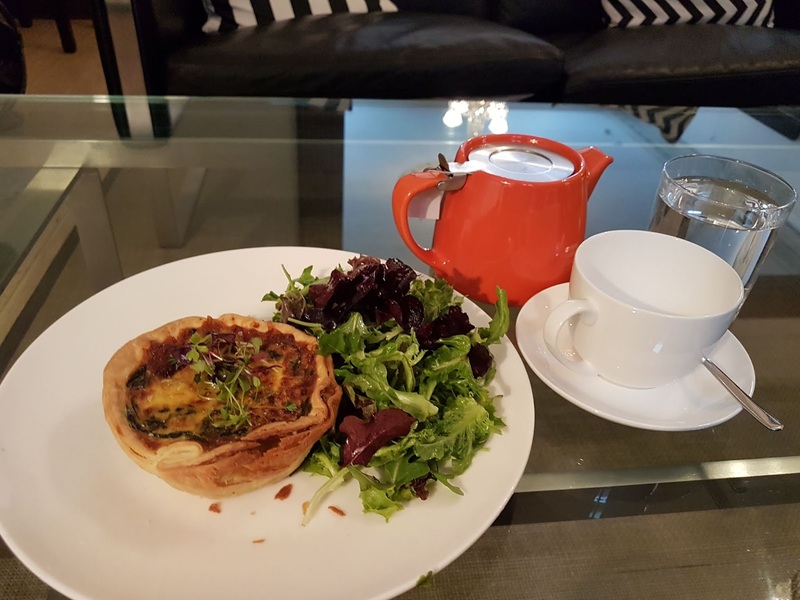 The quiche looks fantastic! Sorry, I should have said that the statue is in Dublin in Stephen's Green. Cute espresso sign! 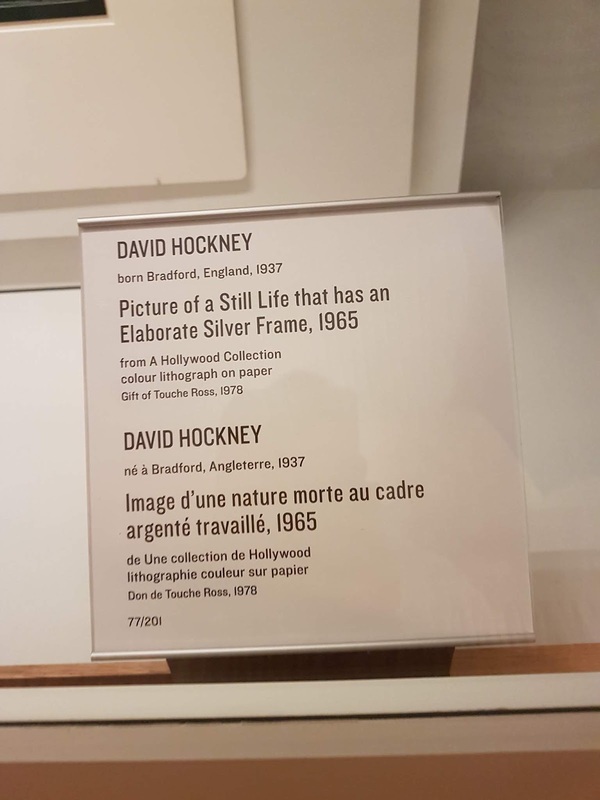 I also like that Hockney piece a lot. It's not one I am familiar with. The sign at the top of the post made me laugh!